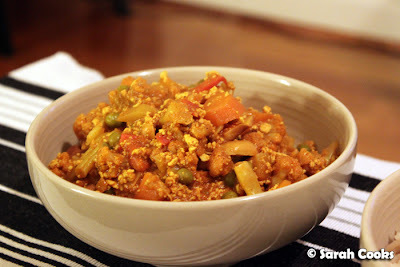 It's been a while since I blogged a home-cooked meal, hasn't it? In fact, I think the last meal I blogged was my entry for the Barossa's Table competition, almost three months ago! Since we came home I've been so busy with work, social engagements and other projects that we've been dining out most nights and have barely cooked at all. (Nothing noteworthy anyway). And on the nights we have been at home, we've been so knackered that we've been getting takeaway and/or home delivery in. Eep! But finally, the Easter weekend came - five whole days of relaxing, five days to sleep in, five days to catch up on my blog, five days to get back into the kitchen! 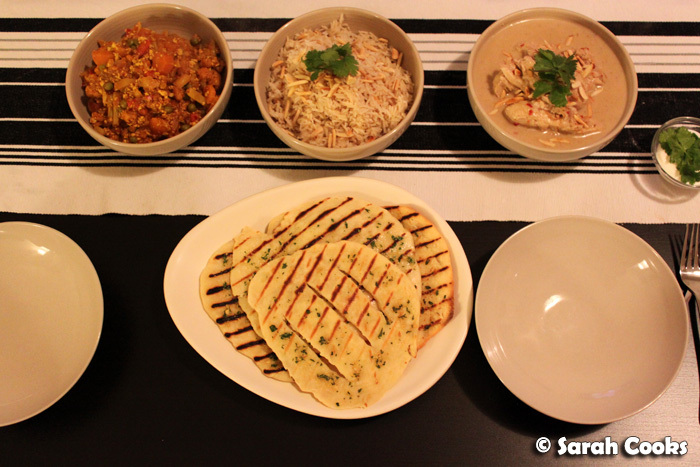 I spent most of Friday happily pottering about the kitchen, putting together this yummy Indian meal. I do enjoy Indian curries, but don't often cook them as they can be quite time consuming. The chicken recipe comes from Nigella's Feast (recipe here! 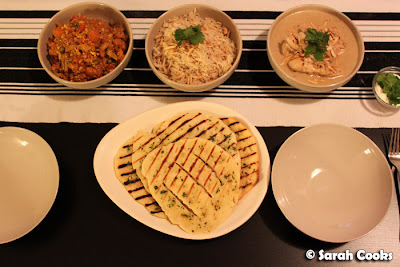 ), I found the korma recipe on the internet, the pilaf was just basmati rice with onions and a few spices, and I adapted Jamie Oliver's recipe for Favourite Anytime Flatbreads to make the Naan. (I've posted the recipe at the bottom of this post!). 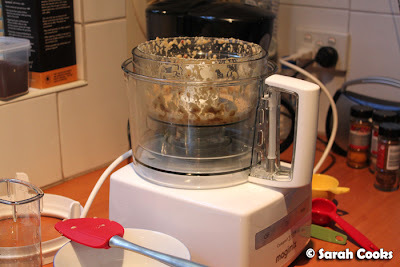 I also got to break in my new Magimix Compact 3200, which was super-exciting! I got it as a belated housewarming gift from my family friends Uncle Mike and Aunty Helen. I love it! It's got 3 bowls of different sizes, and a whole range of super-sharp attachments. I used it to mince up the spice pastes for both curries, to chop up onions, to grate up paneer, and to knead the dough for the naan. This is the spice-paste for Nigella's Mughlai chicken - loads of spices, garlic, ginger, water and almond meal. As I mentioned, I simply googled the recipe for the navratan korma (one of my favourites for when I go to Indian restaurants), and was really happy with how it turned out. 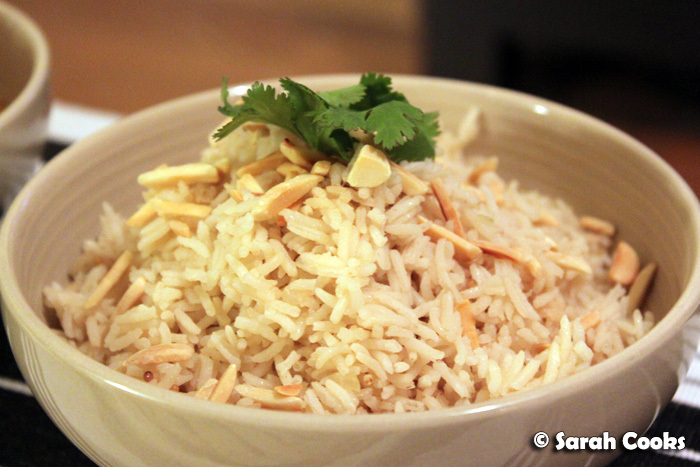 The first step was to fry cashews in ghee, and it was so incredibly fragrant! Love. I was also happy to make something with a big vegetable contingent - something that's easy to miss when you're eating out a lot. 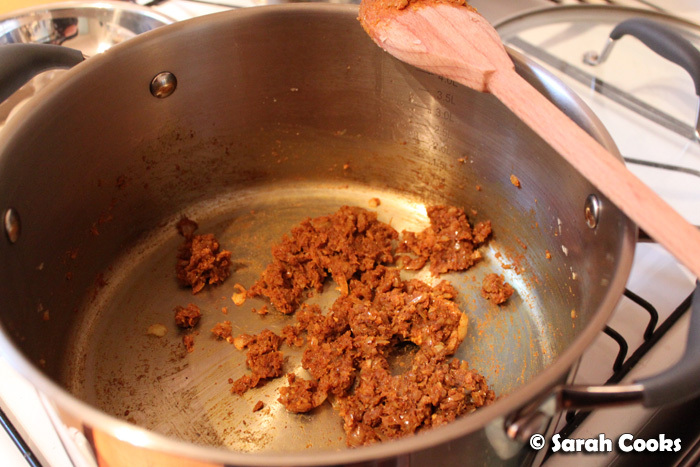 Here's the spice paste for the navratan korma - I love the deep ochre tones of the paste. It was only at the last minute that I decided to make naan to accompany the meal. I love, love, love naan, but it's never worth ordering it take-away, as it always gets soggy by the time you bring it home. This recipe is at the bottom of the post. It's not exactly the same as a proper naan, cooked in a tandoor by an expert who makes naan day-in, day-out, but it's so tasty and easy - I'd highly recommend it! ... roll it into portions, and fry on a griddle! Look how much it puffs up. It really smells like proper naan too. Ta-dah! I was so impressed with how they turned out. 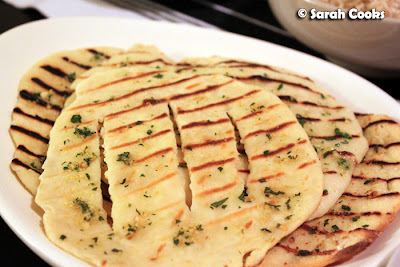 I totally want to try making other naans now: kashmiri naan, cheese naan, plain naan... yum! 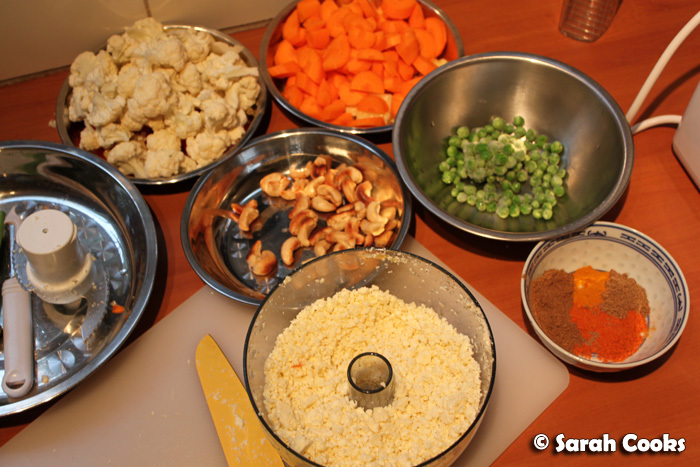 For the topping, simply stir all the ingredients together. For the dough, place all ingredients in the bowl of a food processor, and mix to form a dough. 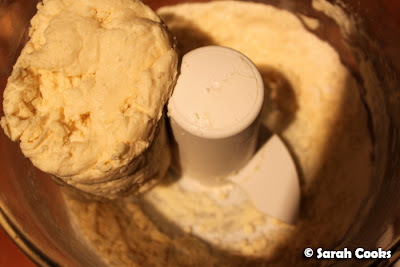 Turn out onto a floured surface, and knead lightly until smooth. Set aside to rest for 15 minutes. 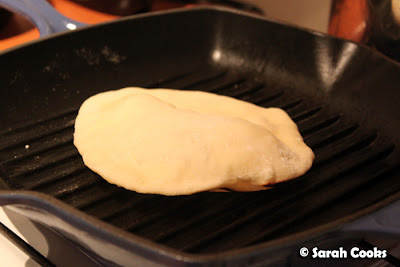 Heat a griddle pan to medium-high heat. Divide the dough into 6 even(ish) pieces, and roll out thinly. Brush a piece of dough lightly with vegetable oil, and cook for 1-2 minutes on the first side, until puffed up and stripily charred. 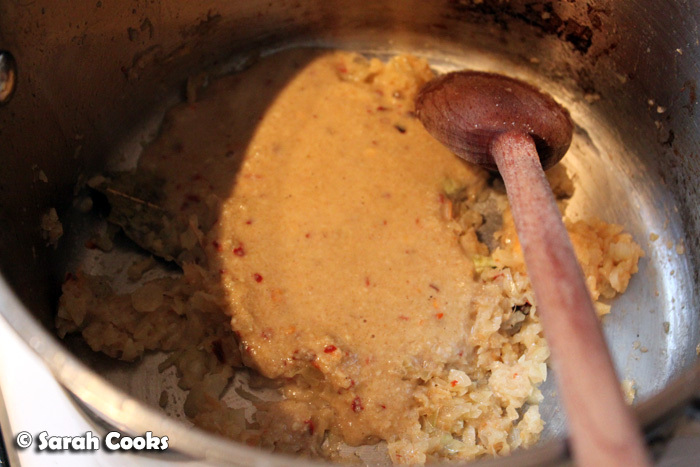 Flip over, brush with some of the garlic-butter mixture and cook for a further minute, until cooked through. 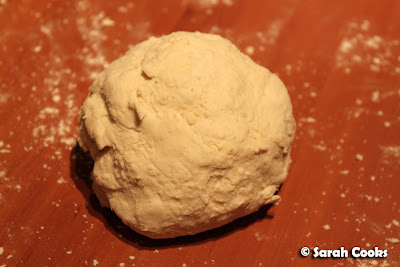 Repeat with the remaining dough pieces, and eat immediately. Enjoy! Did everyone else enjoy their long weekend? What did y'all get up to? The naan looks so good and easy to make. I have a plastic attachment for my processor as well, but have never used it. Will have to break mine in soon! 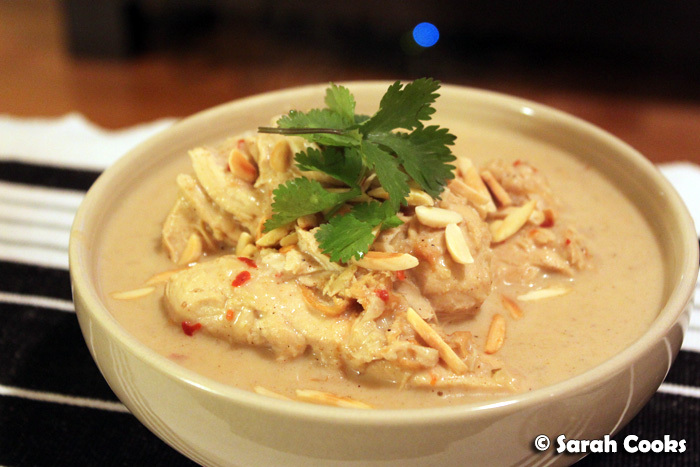 The ingredients of the Mughlai chicken sound so delicious. I live just above an Indian restaurant so have been known to ring up and order naans then nip down while the curry is bubbling away on the stove. However, making your own sounds fun. Spent the entire Easter completely jetlagged - just coming right now, wish I had another five day weekend so I could properly enjoy it!